As a progressive commentator on Fox News and now CNN, Sally Kohn has made a career out of bridging intractable political differences. In this age of dangerous partisan resentment and rising bigotry, she decided to investigate hate itself--to better consider how we can stop it. 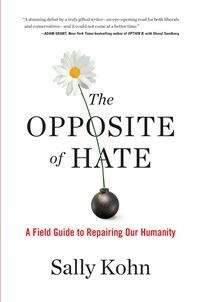 With her trademark humor and humanity, Kohn introduces us to leading researchers and scientists who are exploring the evolutionary and cultural roots of hate. She travels to Rwanda, to the Middle East, and across the United States, talking with former terrorists and reformed white supremacists, and even sitting down with some of her own Twitter trolls. What she discovers is surprising: All of us harbor hate but the powerful acknowledgment that we are all in this together can lead us out of the wilderness. The opposite of hate is connection.